I received this book for free from ALA, Shadow Mountain in exchange for an honest review. This does not affect my opinion of the book or the content of my review. Lord Fenton is a gambler, a dandy, and a flirt—and he must marry or else he will be disinherited, stripped of his wealth and his position. He chooses Alice Stanbridge for two simple reasons: he once knew her as a young girl, and she is the least objectionable option available to him. However, Alice has harbored feelings for Fenton since their first meeting ten years ago, and she believes his proposal is real. When she discovers it is not, she is embarrassed and hurt. However, a match with the most-eligible bachelor in London would secure not only her future but that of her family as well. 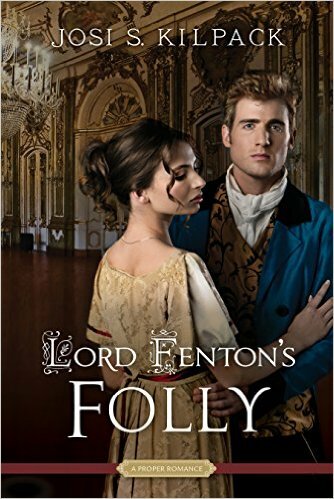 Determined to protect herself from making a fool of herself a second time, Alice matches Lord Fenton wit for wit and insult for insult as they move toward a marriage of convenience that is anything but a happy union. Only when faced with family secrets that have shaped Fenton’s life does he let down his guard enough to find room in his heart for Alice. But can Alice risk her heart a second time? The brief: Lord Fenton’s Folly by Josi S Kilpack is one of the first books I picked up at ALA this year. I love the Shadow Mountain Proper Romance series and Regency Era historical fiction. In the vein of Sarah M. Eden’s books set in Regency era London. The readability: Picked it up and never put it down, no drags in plot. The book: Witty banter, depth of character, real life issues.